Listen MPR News' Mark Zdechlik reports: Who is Tina Smith? Updated 11:41 a.m. | Posted 9:55 a.m.
Gov. Mark Dayton confirmed Wednesday that he's chosen Lt. Gov. 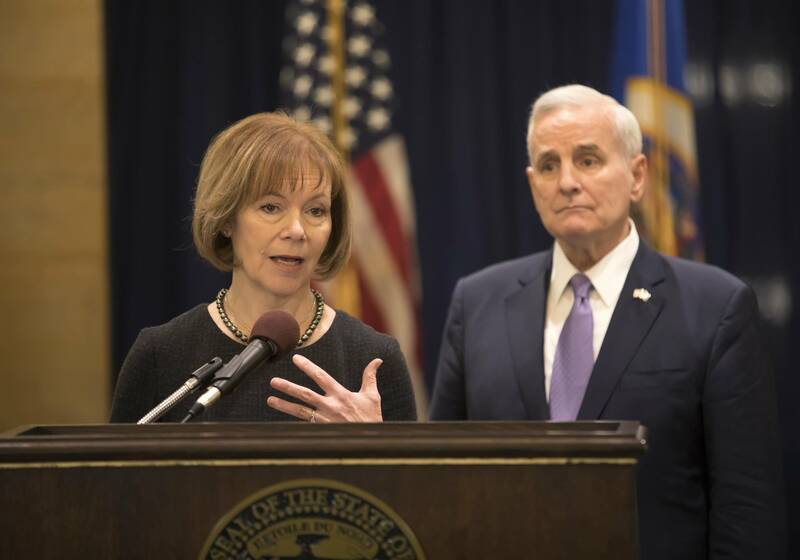 Tina Smith to replace resigning DFL Sen. Al Franken in the U.S. Senate. Smith said she will run for the seat as well in next year's election. Smith, a Democrat, has served as Minnesota's 48th lieutenant governor since January 2015. Dayton picked Smith, who was his chief of staff, to be his running mate as he began the campaign for a second term. "Though I never anticipated this moment, I'm resolved to do everything I can to move Minnesota forward," Smith told reporters. Smith said she'd decided this was the best way for her to serve Minnesota in this "extraordinary" time, adding, "I'm prepared to do this. I'm qualified to do this. I have a unique role to play here." She also noted that not all Minnesotans are benefiting from the current economy, noting that in her travels across the state she's seen and heard their economic struggles. She vowed to be an advocate for "economic opportunity and fairness," especially for women and people of color. 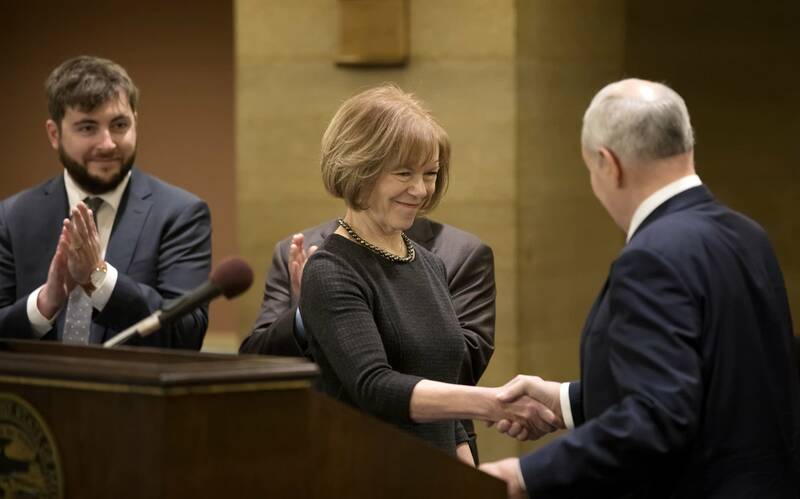 Dayton praised her as a public official of "impeccable integrity" who'll make Minnesota proud in the Senate. Smith, 59, is a New Mexico native who moved to Minnesota for a job with General Mills. She lives in Minneapolis with her husband; they have two grown sons. Before working for Dayton, Smith served as chief of staff to former Minneapolis Mayor R.T. Rybak and ran his unsuccessful bid for governor in 2010. She was also vice president of Planned Parenthood of Minnesota, a job not listed in her official governor's office bio. She has been a more visible lieutenant governor than her predecessors. She goes to ribbon cuttings that Dayton can't attend, but she's also often by his side for major announcements and remains a trusted advisor. Smith has been at the forefront on several administration priorities, including rural broadband expansion, early childhood education and economic development. She leads the Destination Medical Center initiative, a public-private economic development partnership in Rochester, Minn. Speculation about Smith running for governor in 2018 began before she took office as lieutenant governor. But she announced in March of 2017 that she would not be a candidate. Smith told MPR News at the time that she spent several months carefully considering a bid for governor but ultimately decided against it. "For me it was a personal decision as I thought about how I want to spend my time and where I can make a big difference," she said. "There are so many different ways of contributing to the future of this state." Smith's ascension was set in motion by Franken's decision last week to leave the Senate in the face of mounting accusations of sexual misconduct before and during his time in office. Franken had spent the past few weeks pleading for forgiveness in response to the accusations. At least eight women shared stories of him touching them inappropriately without consent during photo-opportunities, on a celebrity tour to military installations abroad or at political events. The common pattern they described included allegations that Franken groped their buttocks or breasts or tried to kiss them. Franken had hoped to make his case to the Senate Ethics Committee that his behavior shouldn't require him to give up the seat. But as new allegations trickled out, the political pressure began to ratchet up and most of Franken's Democratic Senate allies urged him to step aside. Standing on the Senate floor Thursday, he said he could no longer be an effective senator for Minnesota but insisted that some of the allegations against him were "simply not true ... others, I remember very differently." Franken hasn't said yet exactly when he's exiting the Senate. Smith said Franken's office has indicated that will happen sometime in early January. While she applauded Franken as an effective voice for Minnesota, Smith made it clear she will not be in his shadow and that she should not be underestimated as a politician or as a candidate for election in 2018 in what likely will be a highly competitive race. Next year promises to be a remarkable election cycle for Minnesota with an open seat for governor, campaigns for two U.S. Senate seats (U.S. Sen. Amy Klobuchar is up for re-election) as well as elections for the U.S. House. "I will take on this role in my own way using my own judgment and experience," she said. By naming Smith, Dayton creates uncertainty for the state Senate. Minnesota's succession plan calls for the state Senate president to become lieutenant governor, so as Smith moves to the U.S. Senate, state Sen. Michelle Fischbach, R-Paynesville, will move into Smith's position. Republicans currently control the state Senate by a single vote, and in theory, Fischbach's seat would need to be filled in a special election. But Republicans could try to go to court to delay her resignation or get a court ruling that she can do both jobs. The Minnesota GOP slammed Dayton's appointment of Smith as a political game. "It's an underhanded 'House of Cards' style move," Republican Party of Minnesota Chair Jennifer Carnahan said in statement. "This is clearly an attempt to throw the Republican majority in the Minnesota Senate out of balance." Carnahan told MPR News later: "I'm not here to say who he should have picked or shouldn't have. I think the opportunity for him would have been to ... select someone to represent all Minnesotans, not his right hand and inner confidante ... I don't see how that represents what's in the best interest of Minnesota. But it is what it is and we'll move forward and we will defeat Tina Smith next November." Dayton on Wednesday indicated he'd be comfortable with Fischbach as the state's lieutenant governor. There could be some consternation coming, however. The Associated Press reports that Fischbach expects to keep her spot in the Senate when she becomes lieutenant governor. According to a draft plan obtained by the AP on Wednesday, the Paynesville Republican was told by the Senate Counsel's office that the Minnesota Constitution allows the Senate president to hold both jobs, so that's what she plans to do for the remainder of Dayton's term. The constitution says that if the lieutenant governor's office becomes vacant, the post shall go to the last elected presiding officer of the Senate. Fischbach's plan would likely be challenged by Minnesota Democrats, since it puts a Republican a heartbeat away from the governorship and also allows the GOP to preserve its 34-33 majority. Dayton told reporters that he has asked Democratic Attorney General Lori Swanson for a formal opinion because he doesn't think the Senate president can hold two jobs.